Without this man Hollywood would not exist! "[Keith] pulls back the curtain to tell the true story behind the foundation of perhaps the most famous city in the world and tells it with precision, an attention to detail, and also with a personal touch not seen in other biographies of the city. A fascinating read and a treasure trove of information." LOVED the book! It's a missing, ENDLESSLY fascinating link to the history of Hollywood. Thank you for researching and writing it!! I hope it's been widely well recieved, as it deserves to be. Take care, and thank you again. Look for the upcoming academy award winning Movie!!! The screen play is almost completed. 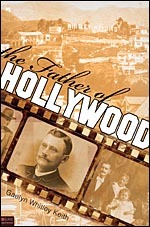 Buy a book today and enjoy the amazing story of the founding of Hollywood!